Verant Group (barleymash, Tavern, True North, Sandbar and more) Executive Chef Kevin Templeton will face off against the legendary celebrity chef on Beat Bobby Flay, airing on August 25, and in conjunction with his Food Network debut, Chef Templeton will host a viewing party at barleymash to celebrate the event. 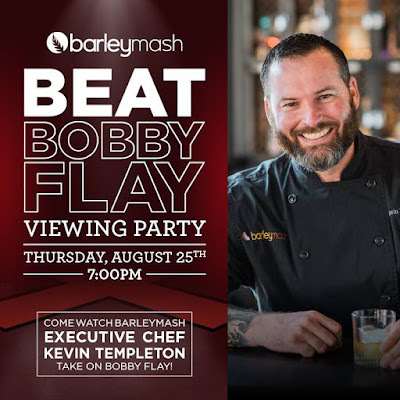 At the barleymash viewing party on August 25, Chef Kevin Templeton will be serving up free, bite-sized portions of the dish(es) that he cooked up on the show. Come cheer on Chef Templeton at barleymash on August 25, located at 600 Fifth Avenue in San Diego's Gaslamp. For more information, visit barleymash.com.